Citation Information: J Clin Invest. 2019;129(2):647-658. https://doi.org/10.1172/JCI123878. 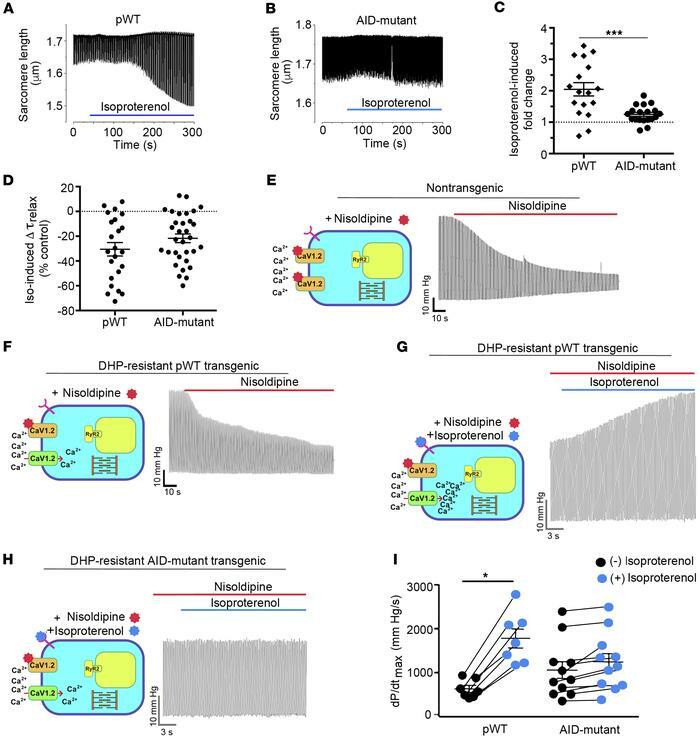 Attenuated β-adrenergic–stimulated inotropy in AID-mutant α1C transgenic mice. (A and B) Cells with robust shortening induced by 1 Hz electrical stimulation in the presence of 300 nM nisoldipine were used. Isoproterenol (200 nM) was superfused with 300 nM nisoldipine. (C) Plot of isoproterenol-induced fold change in sarcomere length compared with before isoproterenol. Mean ± SEM; n = 17 for pWT α1C cardiomyocytes and n = 19 cardiomyocytes for AID-mutant α1C. ***P < 0.001 by t test. (D) Plot of isoproterenol-induced percentage of change in τrelaxation of sarcomere length compared with before isoproterenol. Mean ± SEM; n = 23 cardiomyocytes from 3 mice and n = 32 cardiomyocytes from 3 mice. P = 0.16 by t test. (E and F) Representative traces depicted effect of perfusion of 300 nM nisoldipine on left ventricular contraction in isolated Langendorff-perfused hearts resected from NTG mice and pWT α1C transgenic mice. (G and H) Representative traces of nisoldipine-resistant LV pressure before and during isoproterenol infusion, in hearts resected from pWT α1C and AID-mutant α1C transgenic mice. (I) Quantitative summary of dP/dtmax before and during isoproterenol infusion. n = 7 pWT α1C transgenic mice; n = 11 AID-mutant α1C transgenic mice. *P < 0.05 by t test.